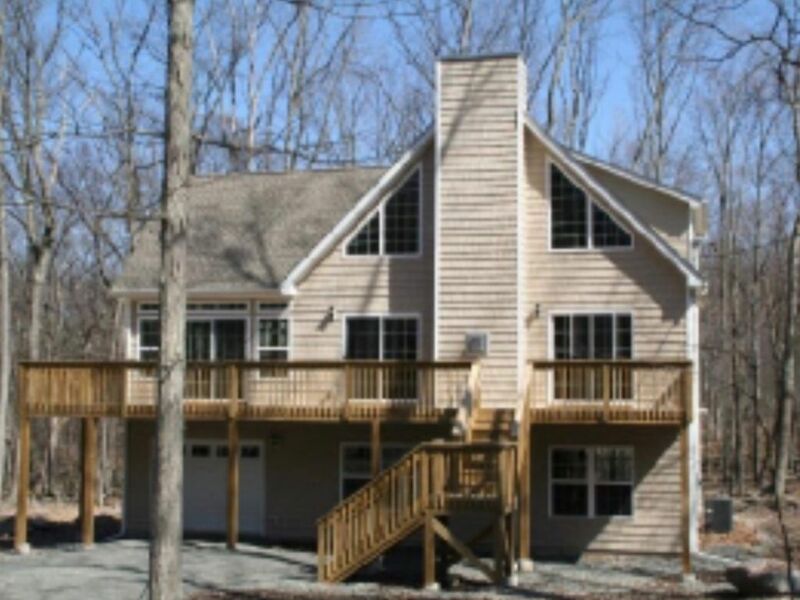 For rent is a beautifully kept, 3 bedroom, 2.5 bathroom home located in Masthope Mountain Community. This home features a large, all glass den, living room with a full stone fire place, as well as a large loft. This home boasts a fully surrounded deck for barbecuing (gas barbecue included) or lounging. For your convenience, cable, WiFi, and a washer and dryer are included. In addition, the kitchen contains pots, pans, silverware, dishes, coffee machine, microwave and dishwasher. This location is also walking distance to the large community lake, which offers paddle boating, canoeing, a life guarded beach, and swimming. The community boasts horseback riding, its own ski mountain, beautiful lodge, sports bar, tiki lounge, pool, deli, volley ball, paddle ball, baseball field, and bocci court. The community lounge offers weekly activities such as bingo and holiday events as well as a restaurant. Reserve this home for your next family vacation today! Spacious, clean and comfortable home! Close to everything. Love this house. It’s our second time staying in this house. We love that it’s clean and so spacious and the owner is very accommodating. Great property. Very well maintained. Owners are terrific! We own a house in Masthope and rented this one for a family celebration. It was perfect. Would definitely seek out this listing again. GREAT RENTAL. GREAT PEOPLE TO DEAL WITH. THE HOUSE WAS SPOTLESS, AND EXTREMELY COZY. WISH I HAD MORE TIME TO STAY AND ENJOY THE MOUNTAIN FRESH AIR. PETER COULD NOT HAVE BEEN MORE HELPFUL. We had an amazing time in this wonderful clean spacious house. Pictures are exactly how the house is. Absolutely a lovely time. Thank you. Beautiful, clean, roomy house in a development filled with activities for children.......I am now looking to buy!